It’s Not Too Early to Start Thinking about Great Lent! 3 Answers from Father Andrew: What Kind of Music is Suitable to Listen to During Great Lent? Great Lent is upon us. Here’s the first principle: If during Lent you find yourself getting proud of your fasting… quick, eat some meat! Pride is much worse than breaking the Fast. Fasting is not what Lent is all about. The purpose of Lent is to bring us nearer to God, nearer to our brothers and sisters. Fasting is only a tool. An example of how not to do it: When I was in Episcopalian seminary long years ago, I made myself a strict Lenten rule and kept it to the letter. Then all during Lent I kept comparing myself to my classmates who, I thought, were not being as pious as me. Did I know that? Perhaps they were fasting and praying in the way Christ commanded: “when you pray, go into your room, and when you have shut your door, pray to your Father Who is in the secret place” (Matthew 6:6). By the end of Lent I was filled with pride and far worse off spiritually than I was at the beginning. The Orthodox Church does not have fasting laws which it is “mortal sin” to violate. The Orthodox Church has fasting rules, guidelines for fasting. (Generally speaking, Orthodox rules of all sorts are maximalist, telling us what to aim for, calling us up higher. Western Christian rules have tended to be minimalist: what must we do? what is the minimum “necessary for salvation”?) Orthodox fasting rules are observed strictly by monastics and, especially during Lent, by many clergy and laypeople. Others keep the first week of Great Lent and Holy Week very strictly. 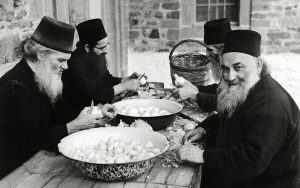 However, the extreme fasting of late Holy Week is generally observed only by monastics. I heard of a new parish populated mostly by converts who took the late Holy Week rules literally, and by Holy Saturday they were dropping like flies. Don’t do that. The purpose of fasting is not to make us sick. It is hard to know exactly what some of the fasting rules mean and, this being the Orthodox Church, there is no authority to define them for us. Different Orthodox interpret them differently. Does “no wine” mean no alcoholic beverages at all? Some Orthodox consider beer permissible during Lent, but some do not. Does “no oil” mean no olive oil (the only kind available when the fasting rule was made) or no oil whatsoever? I once heard 2 women from different Greek villages debating this animatedly. In one village, no oil of any sort was used. In the other even milk was acceptable during Lent. A new convert once asked me which of these many variations were the “correct” ones. I answered that there is no answer. Later, I wished I had added, “Go feed the needy during Lent, and then we’ll talk about it.” During Lent, it is also common for people to give up some other indulgence. In my case that would be chocolate candy; for somebody else, maybe wasting time on the computer, or smoking, or complaining or …? However, don’t overdo this, lest excessive piety beyond the Church’s rules lead you into pride. Weekdays: No meat or meat byproducts (eggs, for example, and jello, I guess), no fish, no milk or milk products (cheese, etc. ), no wine or oil. Seafood with no backbone is permitted – shrimp, calamari, for example. I have yet to hear a good explanation of this last strange rule. Does anyone here know? Saturdays and Sundays: wine and oil are permitted. Annunciation, March 25, and Palm Sunday: fish, wine and oil are permitted. Holy Week: no meals from Holy Thursday through after the Paschal Liturgy. (Remember, this is kept by monastics, but rarely by those of us who live in the “world”.) Holy Thursday: wine and oil are permitted at the evening meal, to get us through the long 12 Gospels Service. Holy Friday is the strictest fast day of the year. All are urged to eat little or nothing, at least till 3 p.m., the hour of the Lord’s death. While we’re on the subject, Bright Week (the week after Pascha): After the Midnight Paschal Divine Liturgy, many churches sponsor a Paschal feast, with people bringing the foods they most missed during Lent. This is a holy blast! Be sure to attend. The Wednesday and Friday meatfest is omitted during Bright Week. Fast with the Church, using the Church’s fasting rules as a guide. Keep food simple. Eat light. Avoid snacks if you can. Remember that the Church’s fasting rules may be adjusted for good cause: youth, age, health, pregnancy, travel, family situations and so on. You do not need a priest of bishop to dispense you. Use your common sense. If fasting is new to you, start slowly this year and work up to the full Fast in due time. Make sure you get sufficient protein and calcium. If your fasting rule turns out to be too hard or too easy or impractical, it’s alright to adjust it. If anyone serves you non-fasting food, eat it gratefully without mentioning the Fast. (Definitely do not do the “Oh, I can’t eat that, I’m Orthodox” act.) Then go back to the Fast. Above all, keep the spirit of the Fast: Lobster and vodka are both technically legal but not exactly appropriate! During Lent seek God and His will. Simplify your life. Cut back on entertainments. Don’t just give up things. Take on good things. Try to concentrate on what’s most important, God and your neighbor. Come to worship more often if you can. Most parishes offer the Wednesday night Liturgy of the Pre-sanctified Gifts. In the Slavic tradition, this is usually offered again on Fridays. In Greek and Antiochian churches, on Friday nights the lovely Akathist to the Theotokos is sung, in celebration of the great feast of the Annunciation to the Virgin Mary on March 25. Set aside time for extra prayer and study, and for your family and those you love. Take what you save by eating less, and give to the needy. Many jurisdictions and parish churches have special Lenten collections of food or money for the poor. What will fasting do for you? The purpose of fasting is to teach us to keep a discipline, so that when you need to give up something important (your neighbor’s wife? robbing banks?) you’ll be in practice. Fasting is like practice for athletes to prepare them for the real game. The purpose of fasting is not to make us suffer. This is why vegan Lenten desserts are permitted. A non-Orthodox friend, on hearing of our Lenten fasting, once asked me, “What ever do you eat?” Ask a silly question, get a silly answer: I replied, “Roots and berries.” But seriously, there are many delicious vegan recipes on-line and in Orthodox recipe books. If you love Indian food, as I do, go Indian. On the other hand, if you have a special passion for Indian food, you may want to give that up for Lent – just so you set a rule and try to keep the discipline. My wife has many delicious strict Lenten fasting dishes. I look forward to Lenten food . Well, until late Lent when I begin to get desperate for a cheeseburger… but it’s worth waiting till Pascha. Fasting from food without fasting from sin leaves us worse off. A Pre-Lenten Matins hymn warns that fasting without love, humility and mercy makes us just “like the demons who never eat at all”. So as you fast, work on overcoming a particular sin or failing, and if you fail (you probably will) go to Confession and try again. Remember, Christ taught that evil is driven out not by fasting alone, but by “prayer and fasting”. What will fasting do for you? Don’t expect quick results, but over the years it will help get your ego out of the way. Fasting will help you gain control over the desires for self-will and immediate self-gratification. 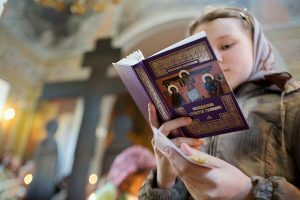 Fasting will unite you with Christ who sacrificed Himself for you, with the many hungry people in the world, and with 250 million Orthodox Christians in every land with whom you are keeping the Fast. Strict fasting may produce a spiritual lightness before Lent is over – not to mention physical lightness, for fasting is good for the body, too. Goodbye, bad cholesterol! Fasting adds variety: eating the same things every day is boring. You’ll learn that less is more: ordinary food tastes better after you have been fasting. And if you have kept the Lenten Fast, the Paschal Feast is just wonderful. It will give you the feel of what Christ’s Eternal Banquet will be like after the “fast” of this earthly life. Finally as I said at the beginning, if you want to have a good Lent, above all do not run around judging other peoples’ fasting or lack of fasting. That is none of your business. It is between them and God. Note the last line of the Orthodox Church’s Lenten prayer, the Prayer of Saint Ephraim of Syria. Pray it every day.